It will be six weeks on Sunday until the Manchester Marathon and I think it’s fair to say that my training has not gone to plan at all due a knee injury. However Thursday nights training run was a success so I thought I’d share with you where I’m at right now. This was my longest run since the Yorkshire Marathon back in October, yes, OCTOBER! I can’t quite believe it has taken me this long but like anything else where injury is involved these things take time and it’s best to do it right. Anyway, I was going to try either 10k or 10 miles on Thursday night; there was literally no plan other than go out and run and see how I felt. I mapped a route out in my head, strapped on lady Garmin and off I went in to the night! I got to 10k and felt good so thought I may as well carry on to 10. However I’d misjudged the route and ended up doing 11 and even though I had done 10 miles on Sunday that extra 1 mile was HARD. It felt great to get the miles in my legs and it’s also a confidence boost too knowing that I am still capable of running far and it’s just a case of building it back up. I also managed to beat my 10 mile time from Sunday by a minute as well, happy days. 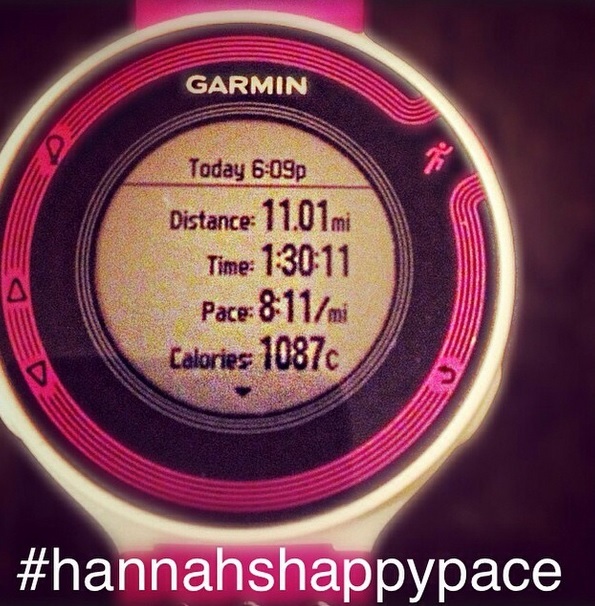 If I averaged 8.11/mi pace for a marathon I’d be finishing in 3.34. Looking forward to pushing myself harder as I get back to track soon and start doing some shorter, faster runs at half-marathon pace/quicker than half-marathon pace with Dane.